As water conservation becomes an increasing concern, many stadium and arena operators are implementing different methods to improve water stewardship. They are doing this for environmental reasons and saving money in the process. In some areas, local utilities are helping. Stadium Management Company, which runs Sports Authority Field at Mile High in Denver, received a rebate from Denver Water worth $60,000 or 40 percent of what it paid for a new irrigation control system. The system has moisture sensors under the stadium’s turf and more water meters around the 89-acre site to better track water use. Tracking water use in this way means the irrigation system only runs when the moisture levels require it. If it’s raining, the irrigation system senses there’s no need to run. The company also received $18,000 in rebates for other reductions in water use, such as the installation of toilets that use about 20 percent less water per flush for the stadium’s 144 luxury boxes. Several other venues have had excellent results installing water conservation systems. The Anschutz Entertainment Group, which runs the Staples Center in Los Angeles, has replaced all 178 of its urinals with waterless urinals, saving more than 7-million gallons a year and $28,200 annually. At the StubHub Center in Carson, CA, recycled water is used to irrigate playing fields, saving about 35 Olympic swimming pools of drinking water each year. Citizens Business Bank Arena in Ontario, CA, uses reclaimed water to fill cooling towers, saving about 115,000 gallons of potable water each week. Another big environmental endeavor in sports involved Target Field, the stadium built for the Minnesota Twins, in 2009. The options for building a water conservation system were limited because the venue’s water and wastewater piping systems were already built. 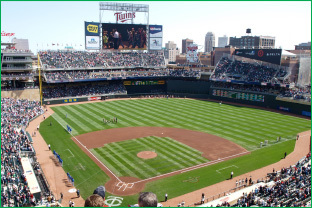 The Minnesota Ballpark Authority called on the help of Pentair, a global producer of sustainable water solutions, to work around this challenge. The result was a custom-designed rainwater recycling system. The ground at Target Field is made up of multiple layers. Grass filters water into a sand layer, underneath the sand is a rock layer and then the water goes into a complex drainage system where it can be thoroughly cleaned through the Pentair filtration system. The filtered and treated water is then used to clean the stadium. The rainwater recycling program, along with several other sustainability projects, has enabled Target Field to become the first professional sports facility to receive LEED (Leadership in Energy & Environmental Design) Gold Certification. Whether you’re a baseball fan or not, this ballpark is a great starting point for a study in creating a more sustainable world. Communities turn to PeopleService for water and wastewater solutions. See the different solutions we provide and let us know the challenge you need help with.